Whilst visiting my mother’s house in Essex, I couldn’t help but take the opportunity to travel to Walton-on-the-Naze (known as Walton for short) with her when she headed to the beach to walk her dog. Whilst she would be ensuring that Poppy had been thoroughly worn out, I would be off searching the shoreline and below the cliffs for fossils. For those of you that aren’t familiar with Walton, it’s is a small coastal town in north-east Essex and home to only around 6,000 people. It’s in an area of the county that is popular with the elderly as a retirement location and in the summer the abundant caravan sites fill up with holiday makers. Enough of that, if you’re interested in the demographic side of things I’ll leave you to research that yourself! 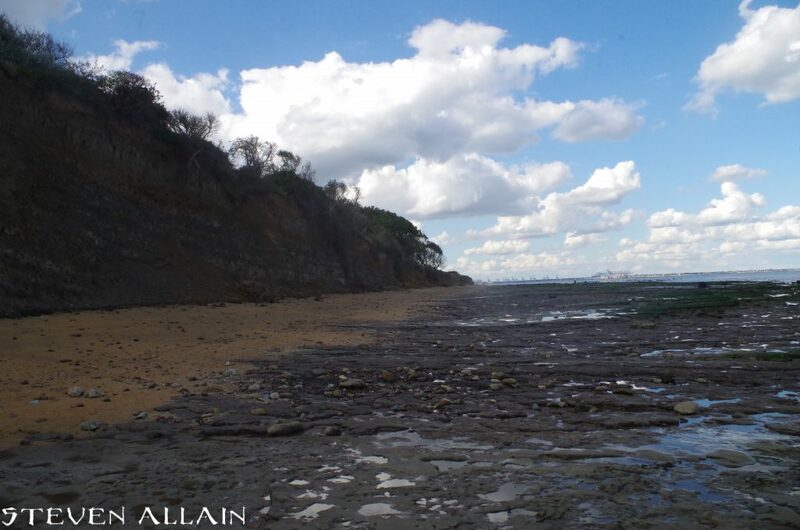 The beach at Walton is locally famous for it’s fossils, two fossil beds are exposed together on the shoreline. 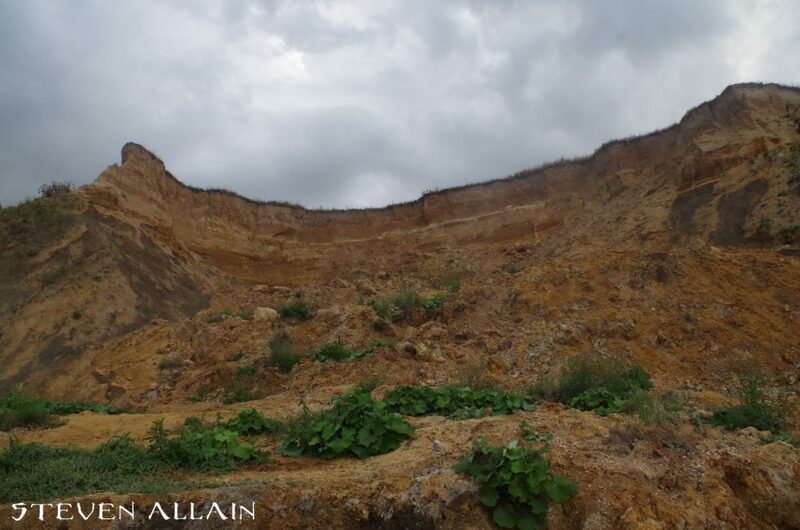 These are the the London Clay (54 million years ago) and the Red Crag formations (2.5 million years ago). A whole range of fossils occur frequently throughout both formations which have attracted attention and study since Victorian times. Of course there are also newer age rocks and gravels above, these are still interesting (if you’re a geologist or archaeologist) but they weren’t the reason I visited. The London Clay which is exposed at Walton was laid down during the Eocene beneath a warm, shallow sea. Due to the then position of the UK, the annual temperature was approximately 10°C higher than they are today. Life at this time was flourishing with the land being covered in tropical vegetation which is evident in the pyritised twigs littering the shoreline. The Red Crag is a quartz-rich sand stained orange to red with iron oxides that also leave a orange glow on the fossils contained within the bed. The formation was again deposited in a warm, shallow sea during the Pliocene Epoch. The most common fossils in the bed are isolated bivalve valves (such as Glycymeris); a sign of the high energy environment present at the time of deposition. The layer in between the London Clay and the Reg Crag is known as the Junction Bed which represents the end of erosive conditions and return to sediment accumulation. Erosion (like that pictured below) means that the coastline is retreating at approximately 0.5 metres a year, threatening local building such as the Naze Tower. 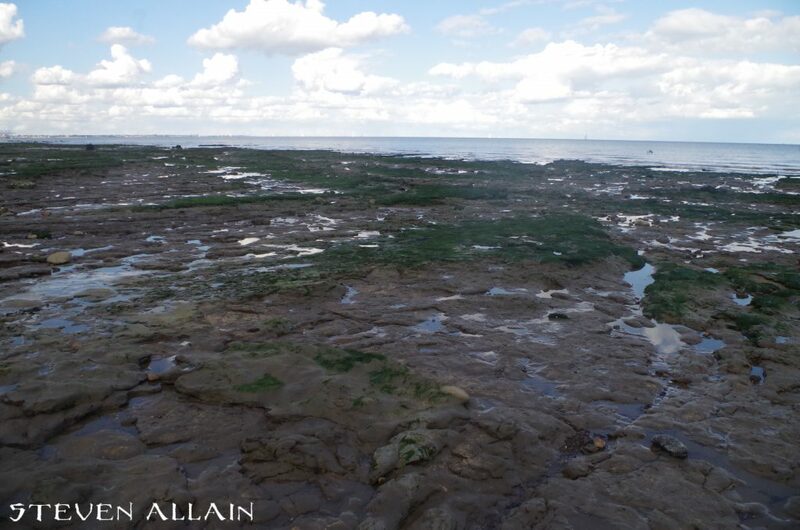 The site itself is abundant in fossils and more are being eroded out of the cliffs all of the time however some days the site can be very productive and others it isn’t. When you visit it is vital to go when the beach isn’t going to be full of other fossil hunters to maximise your chances just in case. On the day that I visited, there were already a number of people on the beach looking for fossils but I was optimistic that I would find what I was looking for. I was hoping to find a Striatolamia tooth or two, Walton has a high abundance of shark teeth fossils including the legendary megalodon (Carcharocles megalodon). Unfortunately I wasn’t able to find any shark’s teeth but I shall be back at a later date to try again! I did however find a number of bivalves and gastropods which I am yet to finish cleaning up. 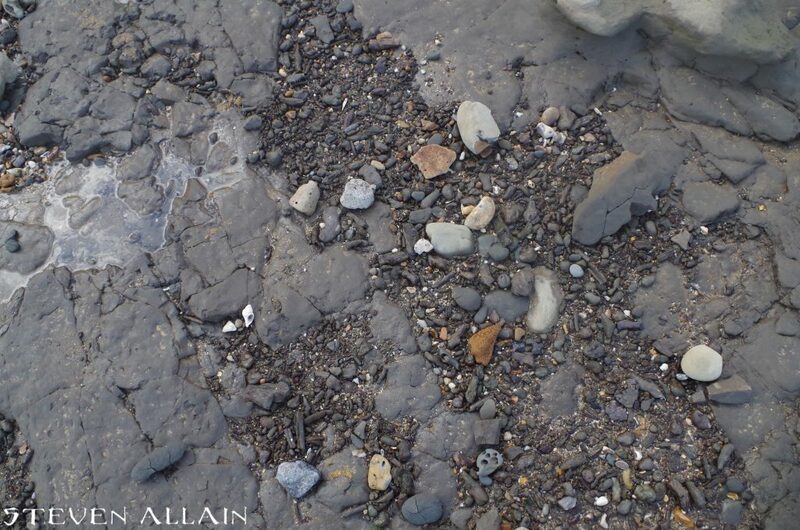 The shore also collects a number of pyrite nodules and fossils, the rule of thumb is that the more nodules you find the greater the chance of finding a fossil. The photo below is of a typical deposit showing a number of nodules and pyritised sticks/wood which also came home with me. If you’d like to know more then please do get in touch and hopefully I will return soon to find a fossil shark tooth or two!